The Prana Men's Redlands tee is slim fitting and made from Fair Trade organic cotton. It features a hand drawn rock-inspired graphic. Main photo is Vortex Blue. A timeless subtle print, slim cut and custom engraved buttons make the Prana Men's Lukas long-sleeve button-down shirt a clean and classy choice. Main photo is Nautical. 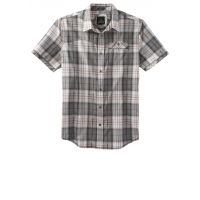 The slim fit on the Prana Men's Patras short-sleeved button-down shirt gives this traditional plaid top a modern style. Made of light, 100% organic cotton fabric that is Fair Trade certified. Main photo is Charcoal. Stay cool this summer in the prAna Men's tank, a solid-colored top with a logo label on the lower hem. Simply perfect! Made of a light organic cotton blend. Main photo is Emerald Waters.